You've probably been noticing Microsoft's ads for their new operating system -- after all, they've spent more money on them than any other software launch campaign in history. In fact, everything about the campaign has been meticulously planned and optimized, so you can imagine journalists' surprise when an unexpected guest showed up at an invite-only launch event on Thursday. 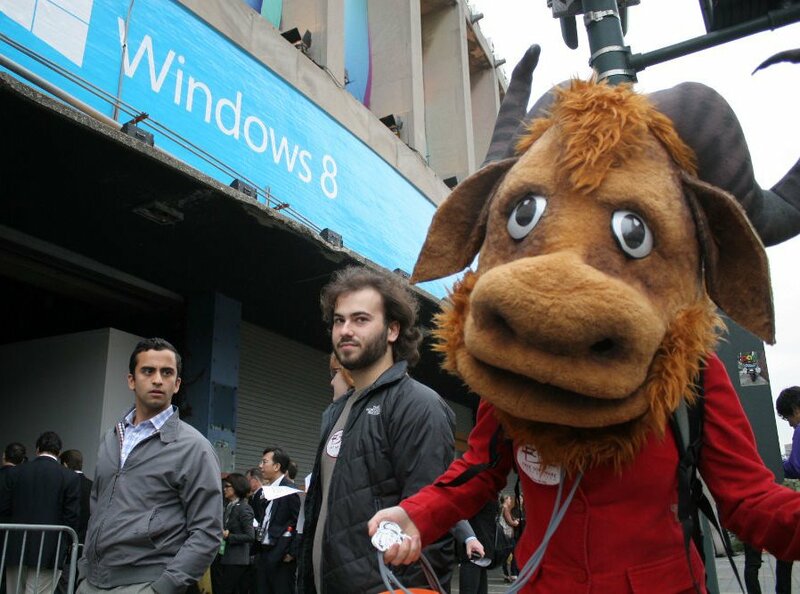 Reporters and security guards at the event weren't sure how to react when they were greeted by a real, live gnu. The gnu -- which, on closer inspection, was an activist in a gnu suit -- had come for some early trick-or-treating. But instead of candy, she had free software for the eager journalists. The gnu and the FSF campaigns team handed out dozens of copies of Trisquel, a fully free GNU/Linux distribution, along with press releases and stickers. Once they got over their confusion, the reporters were happy to see us and hear our message -- that Windows 8 is a downgrade, not an upgrade, because it steals users' freedom, security and privacy. Free software operating systems are the real upgrade, and they don't need a zillion-dollar launch event to prove it. To show Microsoft that their ads won't change our minds, we're starting an upgrade pledge: switch to a free OS, or if you're already using one, help a friend switch. We can pay Microsoft a chunk of change for their new, proprietary OS, or we can stand up for our freedom. The choice isn't as hard as Microsoft wants you to think.